We don't have any trips to Iceland at the moment . A traveler to Iceland will always have the feeling of being far away from everything, despite remaining close to continental Europe, thanks to the powerful landscape. Iceland is an island in constant transformation, with over 200 active volcanoes and, numerous hot springs and geysers all over the place. In stark contrast with the fire, over ten percent of the country is occupied by immense glaciers. Amongst these is the colossal Vatnajökull, the largest in Europe. Especially in summer, The perpetual ice melts and transforms into vast quantities of water which form lakes, waterfalls and extensive fjords of indescribable beauty. On any vacation package to Iceland, nature is guaranteed to be the star of the show. Tap water is drinkable and probably even more healthy than bottled water, as it is sourced in general from the nearest glacier. 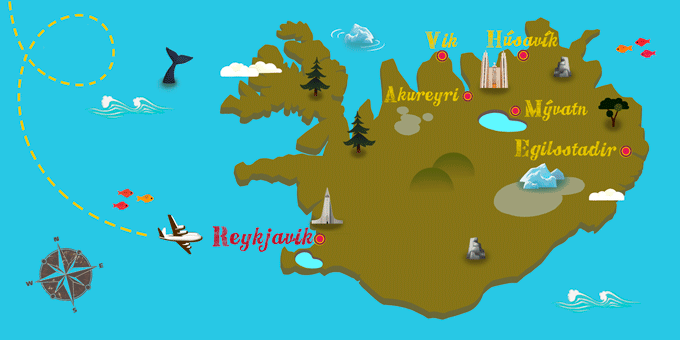 If Iceland has caught your attention, leave us your number so we can call you to discuss the voyage that awaits you.